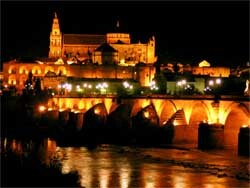 Cordoba is the third city in Andalusia in both size and population, after Seville and Malaga. Nowadays it is a medium sized city where we can see old buildings with architectural elements, when Cordoba was the capital of Andalusia province during the Roman Empire and the Caliphate of Cordoba during the Muslim period. According to archaeological evidence, the city used to have about half a million people in the 10th century, being the largest, cultivated and opulent city worldwide. The mosques, libraries, baths and souks abounded in the city; during the long European Middle Ages in "Corduba" flourished arts and sciences. The city was abundant with springs, public lighting and drainage, during the heyday of the Caliphate. Its historic centre was declared World Heritage by the UNESCO in 1984. Today Cordoba is a great cultural reference of southern Europe, one of the most beautiful and preserved cities and higher quality of life in Spain. Cordoba capital is situated at the crossroads of highways, and is one of the largest traffic infrastructures of the Peninsula. From there also leave the national highway linking Malaga and the Costa del Sol with the radial system of roads and the national highways linking Jaen in the east and Puertollano and Ciudad Real in the north. Cordoba also occupies a strategic position regarding the railway as it is the point where meet the lines linking Madrid to Malaga, Seville, Cadiz and Huelva. Cordoba is easily reached via the Motorway of Andalusia (A-4), linking Madrid with Seville, and also through national roads coming from Portugal, Granada and Malaga (A-45). From Malaga city and the Costa del Sol it is about a two hours drive. RENFE Train Company allows us to cross destinations between Madrid and Seville in the AVE high speed train. So from Madrid it takes less than two hours to Cordoba and from Seville about 45 minutes. Cordoba has its own airport, although there is no regular commercial line. But close by, in less than two hours, are Madrid airport, Seville airport, Jerez airport, Malaga airport and Granada airport. Those who decide to go by plane from the international airports of Madrid, Malaga and Jerez de la Frontera can reach Cordoba within two hours by train and from the international airport of Seville in just one hour. Another much less expensive option is to travel by bus; the connections are very good and represent an alternative for anyone with less budget. Buses leave daily from Madrid, Malaga and Granada and other Spanish cities. It is most practical to move through downtown on foot and walks through the old town are very pleasant. Cordoba is a city that can be discovered on foot, as the historic centre and the main monuments and sights are very close together. A good option for getting around Cordoba is the public bus. It runs from 6.00 until 24.00 hours, although times vary depending on the line. Also, Fridays and Saturdays there is available a night service for the city, the so-called Movibus. Another possibility is the taxi, the most widely used means of transport to travel at night. The Taxi Tour travels different tourist routes in Cordoba for an approximate price of 40 €. You can also ride in horse-drawn carriage through the historic center: the stops are located next to the Mosque and near the Alcazar de los Reyes Cristianos. In addition, there are daily buses to Medina Azahara; the return ticket is € 6, 50. There is available a tourist card (Córdoba Card) for access to the various monuments and recreational services. Bicycles are available to the visitor at four points of the city (Renfe, Victoria Gardens, Avenida Doctor Fleming and Barcelona). You can acquire the card for their use in the Town Hall. The ancient city of Cordoba has the second largest old town in Europe and the largest urban area, declared World Heritage Site by UNESCO. It is precisely here where can be found many of the historic buildings of the city. Outstanding as the most important building and symbol of the city is the Mosque of Cordoba and the current Cathedral, next to the magnificent Roman Bridge, which are the best known facets of the city. Near the mosque-cathedral is situated the old Jewish Quarter formed by many irregular narrow streets, corners and plazas, such as Calleja de las Flores (Flower Alley) and Calleja del Pañuelo (Handkerchief Alley), where you can visit a variety of archeological treasures like the Synagogue and the Casa de Sefarad. 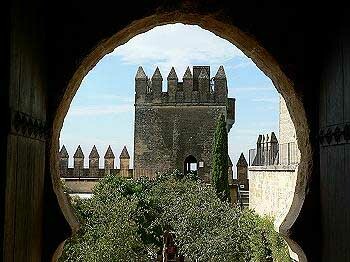 In the southwestern part of the old town is the Alcazar de los Reyes Cristianos, the former lodging of kings. Cordoba has a few nicknames as "the Constantinople of the West" or "Pearl of Muslim Spain”. Historically, the Jewish quarter has been the cultural and ideological centre of Cordoba. The courtyard of the mosque served numerous teachers of different religions who lived in Cordoba to discuss religion, science, literature and philosophy. Here also has been preserved one of the three synagogues that exist today in Spain. Apart from the Mosque-Cathedral and the Synagogue, in this area are located several of the most important monuments in the city: the Arab baths found in the Campo Santo de los Martires, the Bullfighting Museum or local souk. El Almodovar castle is one of the biggest attractions of the province of Cordoba and is located 22 kilometers from the capital where it rises majestically above the town of Almodovar del Rio. Los Jardines del Alcázar de los Reyes Cristianos: One of the main attractions of this monument are the magnificent gardens. Formerly used to feed the inhabitants of the Alcazar, now form an oasis in the midst of a modern city, a place of tranquility and relaxation. La Posada del Porto is the only one of many which once surrounded the square of the same name. Immortalized in "Don Quixote" by Miguel de Cervantes, the building is an impressive example of popular fifteenth-century architecture in Cordoba. The visitor will also enjoy visiting the typical courtyards, protagonists of one of the traditional feasts of Cordoba, the Fiesta de los Patios with popular contests of the most beautiful patios and balconies. Located along the banks of the Guadalquivir River, the Botanical Garden of Cordoba is one of the city´s great lungs. The Botanical Garden is divided into different areas with distinctive characteristics: the Museum of Paleo botany has a collection of fossils and plants; in the section of Ethno botany the visitor can obtain information about the relationship between the evolution of man and plants and the agricultural crops; the Arboretum is a space that contains a collection of trees and bushes from around the world. There is also a garden area reserved for plants that are endangered or difficult to preserve. The jewelry, ceramics, leather and gold are the main elements of craft in the city of Cordoba. Ceramic articles made in this town use as raw material high quality clays and their designs are inspired by motifs of Muslim Cordoba. The visitor will also find workshops with handmade works of wood, plant fibers, glass and metal. In the city centre of Cordoba, the most commercial streets are Concepcion, Cruz Conde, Conde de Gondomar, Tendillas Square and vicinity. In this area can be found brands of national and international prestige, fashion shops and also traditional gift and crafts shops. Cordoba is an important production centre in gold and silver jewelry. The pieces of exclusive designs inspired by both classical and avant-garde are known internationally. Perhaps the best opportunity arises with Joyacor(www.joyacor.es), one of the important events taking place in this city. If visitors want to live the traditional festivals of Cordoba, it is best to go in May. This is when the locals celebrate their Fair in honor of Nuestra Señora de la Salud, the Festival of Patios and Fiesta de Las Cruces. It is also advisable to go to Cordoba in Easter, when the monuments of the Old Town become a wonderful setting for the representation of the Passion of Christ. The festive and cultural character of the locals of Cordoba can also be enjoyed in summer when many events take place, such as the Noches de Embrujo de Córdoba. There are over one hundred traditional tapas bars just in the old quarter. The most famous ones are: Santos (calle Magistral González Francés, opposite the Mezquita) is famous for his potato tortilla; Pepe de la Judería (calle Romero, 1) offers innovative tapas and careful decoration; Casa Salinas (calle Puerta de Almodóvar) offers classic menu and flamenco ambience; at La Sociedad de Plateros (calle María Auxiliadora, 25) founded in 1868 is prepared cod in 18 different ways; in San Miguel-El Pisto (plaza de San Miguel, 1) you will find a more Taurine environment and traditional tapas. Less known, at least for visitors, are the night bars of the city. For a night out in Cordoba you will have to leave the old town and move around the Plaza de las Tendillas: Soul (Calle de Alfonso XIII) is one of the most popular and modern bars, as well as La Comuna (Calle del Cano) with indie music. The Gongora Café (Calle de Gongora) is one of the best places to attend a concert or a monologue of humor. Here we offer you a selection of places in the centre of Cordoba, if you feel like seeing a live flamenco show, going for a drink or some dancing. Flamenco places (tablaos) are: La Buhardilla (calle Cordoba de Veracruz) where you can dine and enjoy a good Flamenco show; La Bulería is a little palace in the city centre (calle Pedro Lopez) with pure Flamenco singing, dance and guitar; El Cardenal in the Jewish quarter (calle Torrijos) presents awarded Flamenco artists. Nightclubs in Cordoba: Metro is a famous disco with gay ambience and good vibes (calle Robledo); QU (calle Gongora) is the meeting place for the beautiful people in Cordoba and is as well a concert hall; Underground (calle Conde Robledo) is decorated like a metro station, with good ambience and alternative music. La Mode (calle Arenal) is an alternative discotheque which offers sometimes life concerts. Places with life performances: Café de la Luna (Plaza Cervantes), Milenium (calle Alfaros), La Mode (calle Arenal), Nucleo (calle Ingeniero Alfonso Churruca) is the habitual place for hip hop and house artists. Riff (Avenida Gran Capitan); Sala Afrika (recinto ferial "El Arenal") is a classic in the Cordobese night, offering as well theme parties (reggae, hip-hop and rock). The most typical dishes of the Cordobese gastronomy are rabo de toro (oxtail), flamenquines de jamón (thin pork roll breaded and fried with ham inside), boquerones en vinagre (pickled anchovies) and the pastel cordobes. The latter is the genuine desert of Cordoba. This is a puff pastry stuffed with quince and covered with chunks of toasted almonds and powdered sugar and cinnamon. A last word: You cannot leave without sampling Cordoba´s most famous dish, the Salmorejo. It is a cream that is served cold as a starter, made from tomato, garlic and bread crumbs. All this is along with a good olive oil and topped with pieces of ham and eggs. Clean air, abundant sunshine and comfortable temperatures in most months of the year, stained the landscape in different shades as the seasons colors are leaving on vegetation. Such are the qualities of this environment, which years ago, when medicine still maintained a close relationship with nature, Cordoba was recommended as the place to relieve respiratory ailments and other diseases.